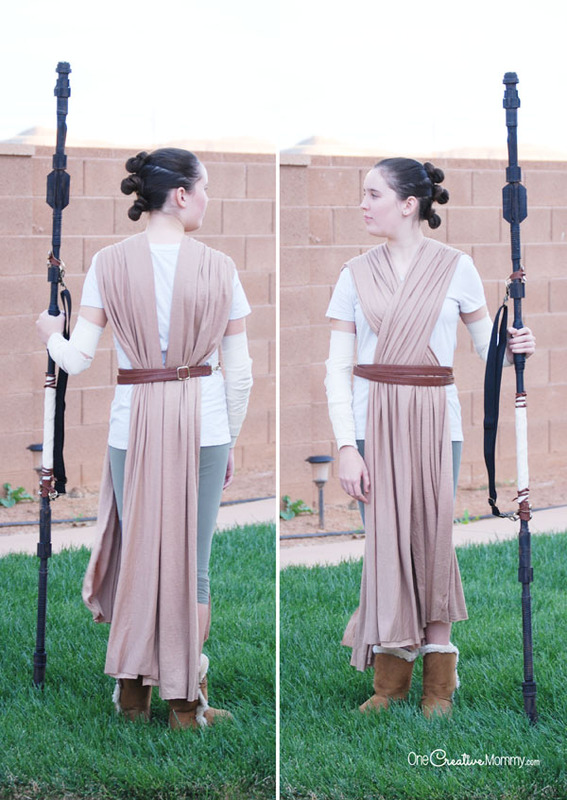 You are here: Home / Blog / Get ready for The Last Jedi with this easy Rey Costume idea! Get ready for The Last Jedi with this easy Rey Costume idea! Who’s excited for the new Star Wars movie, The Last Jedi? Me, me!!! I know some people have been critical that the new movies follow a similar plot to the old ones, but I’ve loved them anyway. I guess I’m just a sucker for a predictable story line with familiar characters and exciting adventures. 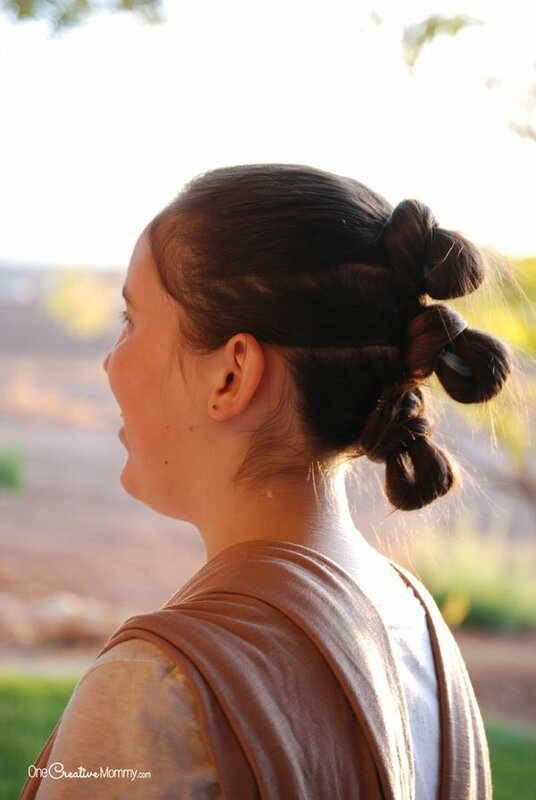 In honor of the new movie and just in time for Halloween, I’m sharing a super simple tutorial for a Rey costume. It’s that time of the year again . . . Spooktastic September! You know I love sharing ideas for Halloween, but because I’ve just moved into a new home, I won’t be able to dedicate the whole month to the holiday this year. Sad. I know. I’ll give you as many Halloween ideas as I can, but I’ve got a whole house full of boxes to unpack, so I’ll have to focus on that, too. To satisfy your taste for all things Halloween, be sure to check out my past ideas. And now, back to Rey! Her costume is so basic that there is no need to go out and buy an expensive costume. (I’m so cheap that I never buy a costume if I don’t have to!) If you have a Deseret Industries, Good Will or thrift store nearby, you’ll probably find all you need there! The t-shirt and pants are pretty easy. Just get as close to the colors you want as possible. If you can’t find short leggings, simply pull them up or cut them off and tie them just under the knee. The great thing about Rey’s costume is that it’s supposed to be old and ragged, so old clothes are perfect. For the brown robe, drape the fabric or sheet over your “Rey’s” shoulder and cut it to the length you want. Next, lay it out on the floor and cut it in half so that you have two long pieces. Drape one over each shoulder and crisscross them in the front. Use belts or purse straps to secure them at the waist. (We used a purse strap. It was perfect because it looked like two belts.) If you are really ambitious, you can also cut up a leather or brown purse to make a storage bag to attach at the waist. We ran out of time and energy and left that off the costume. For Rey’s arm bands, you have several options. Use the cheapest option and what you have around the house. Divide the hair into three sections and try to include roughly the same amount of hair in each section. Starting at the top, create a ponytail with the first section. Instead of pulling the hair all the way through, leave a loop that sticks out a few inches away from the head. Wrap the extra length of hair around around the loop and hair tie, and pin the ends in place. Repeat with the other two sections. I’m sure you’re wondering about Rey’s staff. Unfortunately, that’s not quite as easy a DIY. Boo and her Dad made that together, and it took quite a bit of work. They researched it on the internet and made it from PVC pipe and a bunch of odds and ends. If that’s a bit out of your league, find a broomstick or pole at a thrift store, paint it black, and tie some rags to it. Thanks for stopping by today. Be sure to check out more Halloween costume ideas by clicking on the images below. The images are linked to posts, so click on them! Thanks, AllMYDeals. It was really fun to make, and my daughter loved it. 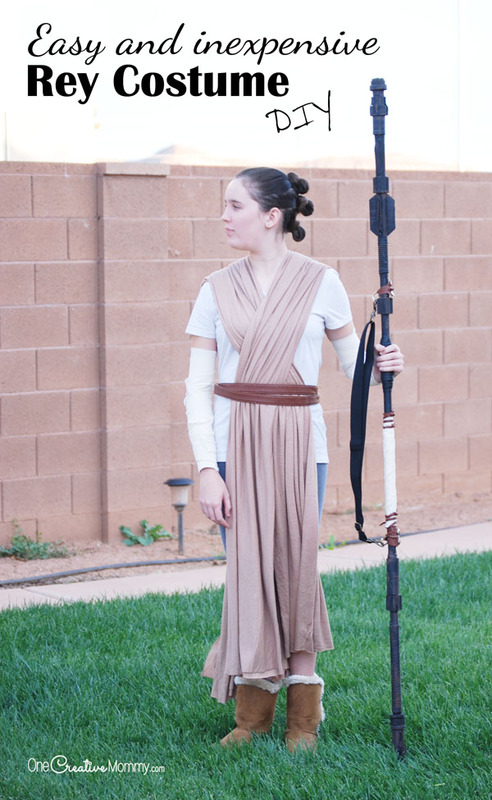 What some absolutely awesome costumes, the Rey one is amazing and it is great that it really is so easy to make. Thanks, Sarah. Halloween is one of my favorite holidays. I love making costumes for my kids. Thanks, Corinne & Kirsty. I’m excited for the next movie, too. I hate waiting when they put out the first preview months ago! Thanks, Jessica. I love making my kids’ costumes, but I’ll admit I’ve been really excited some years when they insisted on a store-bought costume. It takes a lot of time sometimes. This is a great costume. My daughter loves Rey but we got one from the Disney Store. This one looks just as good! Thanks, Amber. I’m sure the Disney store costume is great. I hate spending money, so we always try to make our own. It’s so much easier to buy, sometimes, though. I love Star wars! 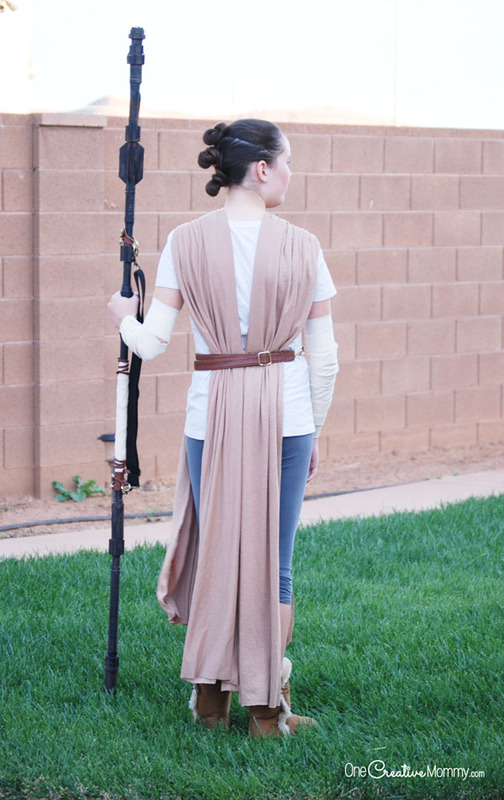 Great Rey costume! Thanks, Megan, and thanks for stopping by and leaving a comment. Have a great day. This is a great costume idea. I have been looking for some costume ideas for this year. I am putting this on the top of my list. So simple yet effective! I love that it is made out of items that would actually probably be around somewhere at home. Can’t believe Halloween is nearly here!! I know, Chloe! Once school starts, Halloween seems to sneak up so quickly. I just moved into a new home. It’s almost time to pull out the Halloween decorations. I hope I can find them! Brilliant and so easy to implement! 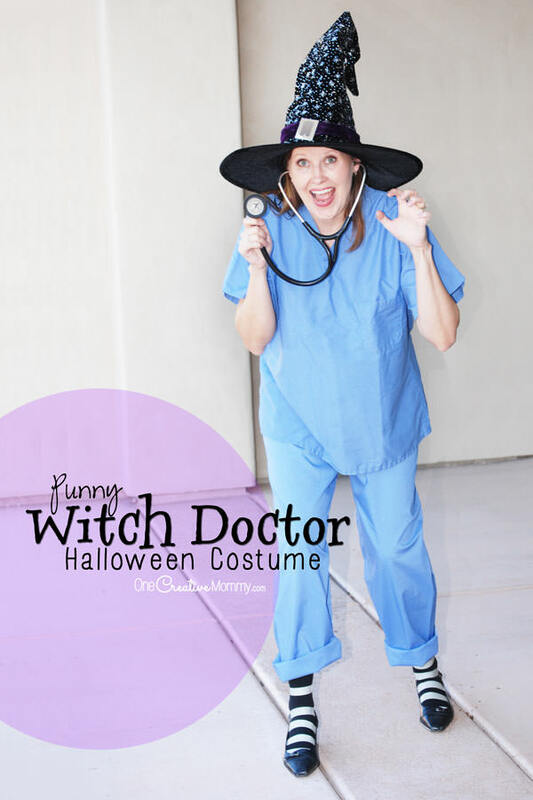 I love easy costumes and ingenious ideas like this one! Thanks so much, Akamatra. I love costumes that can be made quickly and on the cheap! I am not really a star wars fan but I must confess these costumes are so lovely and Very creative. What adorable ideas! My little girl is still in princess mode but I love this! 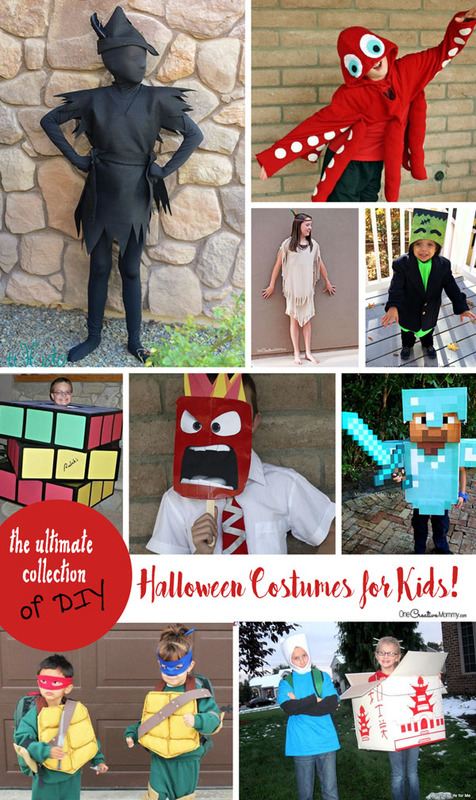 This is awesome DIY costume! It looks easy so I’m going to give it a go. 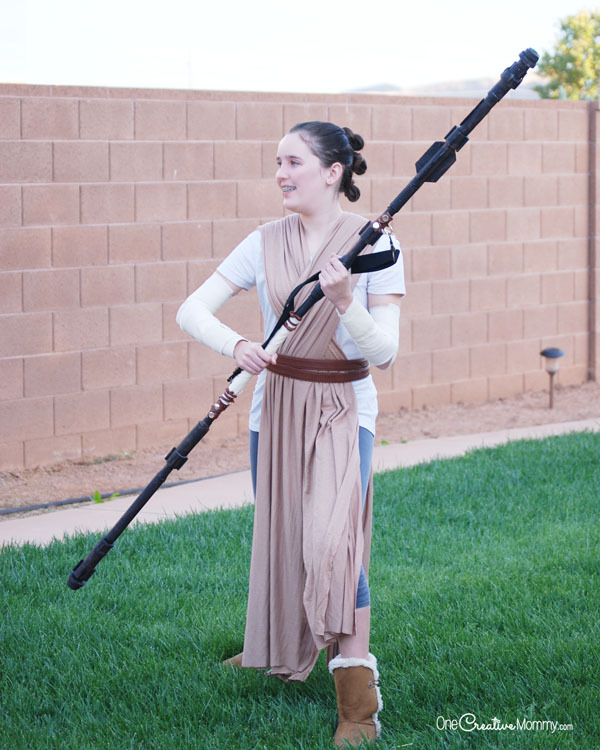 My daughter loves Star Wars and this Rey costume is such a great idea. Thanks, Sharonoox. I hope you and your daughter have a fun time coming up with a costume! Thanks, Ana. That’s actually my daughter in the Rey costume. I wish I looked that young! Same here, Denay. Halloween and Fall is such a fun time of year. It’s definitely time to get out the decorations. The costume look awesome. I can’t wait for the Last Jedi as well. Thanks for sharing. Thanks, Ophelia. I hope the new movie lives up to the hype. What a nice thing to say, All My Deals! My kids and I sure have fun creating costumes every year. Thanks, Anchal. Halloween is such a fun time of year. Maybe it’s all the fee candy! These are adorable! My kids are so excited for Halloween this year. Thanks, Lindsey. Mine are too. It seems like they start planning next year’s costume as soon as they finish trick-or-treating! Nice idea, I will make this an inspiration when my kids would be needing a costume. Thanks, Marcelo. I hope you and your kids have a fun time this Halloween. Good luck with your costumes. What a fantastic, yet simple, Halloween costume! This is something even I could do! Love it! Great article, specially photos are awesome. keep posting this type of article, we love it. I think I can DIY it. Your tutorial was easy to follow. You are very creative. Checking out other DIY you have here. Thanks, Sarah. I hope you find some great ideas that you can use. Good looking Costume with this great idea. Love it. Thanks, Louise. I think when you make the costumes yourself they look much more realistic than the plastic stuff at the store.